The Cold War received much attention in Europe and Asia, but it truly reached all corners of the globe. The strong desire by the United States to keep the Americas free from anything resembling communism resulted in many covert operations that were aimed at either keeping right-wing dictators in power, or doing what they could to put them in power over left-leaning leaders. The most known instance was with Castro and Cuba, but examples can be found throughout Central and South America. This book covers one of most important operations taken on by the CIA, that of the overthrow of Guatemalan President Jacobo Arbenz in 1954. The ousting of President Jacobo Arbenz remains a much discussed event, one which might never be fully explained. In the immediate post-war era, many Central and South American nations were exploring the idea of democracy, and Guatemala was no different. After decades of dictatorships of both conservative and liberal ideals, things came to a head in 1944 and a revolution removed General Federico Ponce and established a Revolutionary Junta with the intent of transitioning Guatemala into a functional democracy. This did not go smoothly, and conflicts of interest across the board resulted in rebellions and the assassination of a key leader on the right in 1949 and ultimately the election of Arbenz in 1950. Initially, Arbenz implemented a joint US-Canadian commission's plan for the government, however business interests of the United Fruit Company ran counter to the new government's agrarian reform plans. With Arbenz's supporters coming from the left and communist organizations and a direct problem with a US corporation, it was an easy step for the US government to label him a threat to the West. What makes this event such a major one is that it shaped US policy in Central America for decades. The CIA operation, code-named PBSuccess, essentially established the ideas and tactics the Agency went on to employ throughout the Americas. 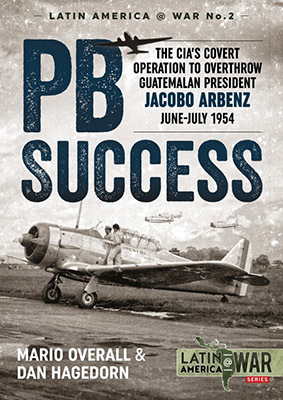 A key factor in those operations was the use of aviation, and this book highlights the use of air power by both the Guatemalan Air Force and the CIA in the operation to overthrow Arbenz. At the time of Arbenz's rise to power, the Guatemalan Air Force was exclusively American in origin, containing an eclectic mix of P-26 Peashooters and P-47 Thunderbolts, AT-6Ds and C-47s, and smaller aircraft such as PT-19s, Ryan STMs, and Beech C-45s. The aircraft, and the operations they engaged in, are well documented in the text and in photographs, with a handful of color profile illustrations adding some useful color information to the story. I have known both authors of this book for some time and am familiar with the level of research they go through to produce a finished product, and this one is no exception. In addition to the text and photos, there are several operational maps included, a comprehensive bibliography, and extensive footnotes that document many of the primary sources they utilized to tell this story, including many declassified CIA reports. The level of effort that went into this publication is impressive, and as such it forms an important part in the story of aviation and politics in Latin America. My thanks to Casemate for the review copy.